Plot: A former wrestler and his family make a living performing at small venues around the country while his kids dream of joining World Wrestling Entertainment. Starring: Dwayne Johnson, Florence Pugh, Lena Headey, Vince Vaughn. 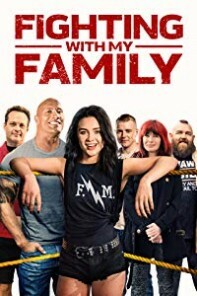 distributed by MGM «Fighting with My Family» in the US movie theaters released on February 14, 2019 and has grossed over $23 million worldwide; dvd and blu-ray release date was set for May 14, 2019. Rent from Netflix and Redbox from May 14, 2019. «Fighting with My Family» in the UK released in movie theaters on March 1, 2019. The movie estimated to release on dvd and blu-ray some time in May or June 2019.